The Crofter's Cottage is a cosy retreat located near Coldingham, Scotland. Hosting one double bedroom, and a bathroom, this property can sleep up to two people. Inside you will also find an open-plan sitting, kitchen and dining area with woodburning stove. To the outside is off-road parking, and an enclosed lawned garden. Resting in a lovely location with pleasant views, The Crofter's Cottage is a delightful retreat in a magnificent part of Scotland. Nestled in the rolling farmland of Coldingham Bay, the village of Coldingham itself enjoys views over the sheltered golden beaches of the Berwickshire coastline. With local surfing and canoeing facilities, the settlement also offers a wide choice of local shops, pubs and restaurants. Further inland, discover a multitude of abbeys, castles, stately homes and gardens. Berwick-upon-Tweed, with its Elizabethan walls is well worth a visit. Eco central heating with woodburner. Electric oven and hob, microwave, fridge/freezer, dishwasher, washing machine, TV with Freeview, WiFi, selection of books, games and DVDs. Fuel, power and all logs for the fire inc. in rent. Bed linen and towels inc. in rent. Cot and highchair. Off-road parking. Enclosed lawned garden. Two well-behaved pets welcome. Sorry, no smoking. Shop and pubs 3.4 miles. 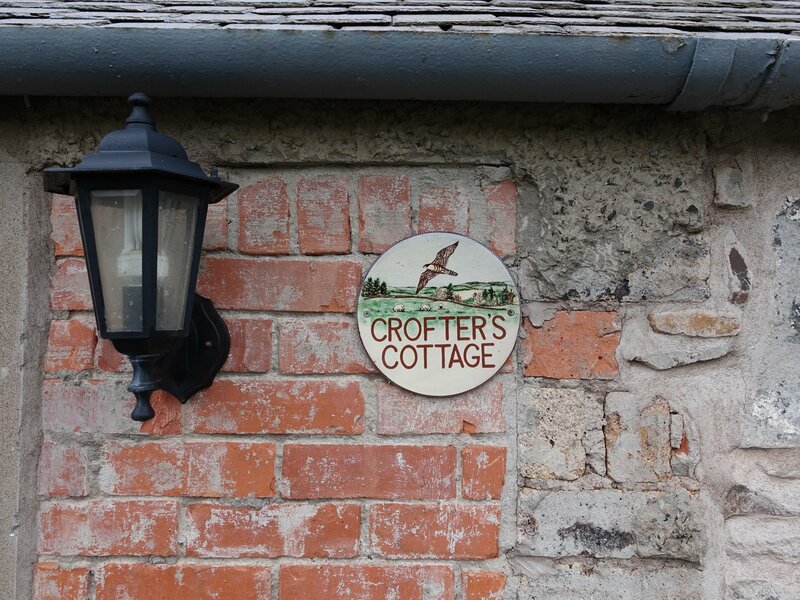 Crofters Cottage is a fabulous place to stay in a beautiful area of Scotland..
Really nice little cottage on a farm in the Scottish Borders.. Gorgeous views over farmland, very quiet, emphasis on working with wildlife, friendly owner (John) and general handyman (Craig). One or two maintenance issues but nothing important. Would we go there again? Absolutely! I have had a delightful and most relaxing holiday in this beautiful and characteristic cottage.. The cottage exceeded expectations. Little extras only added to the enjoyment i.e. biscuits (even biscuits for my dog! ), tea and coffee, hairdryer and dressing gown. The atmosphere inside the cottage was so cosy, and the fourposter bed was so comfortable; I slept amazingly well. I didn't have to leave the cottage to experience the most marvelous birdlife just outside my window and in the garden. My own individual garden was great to sit in or for the dog to play in. I was made to feel most welcome. Coldingham Bay leading on to St Abb's is breathtaking. I was able to do lots of cliff top walking and loved every minute of it. This is an area (and cottage) that I most certainly will come back to - this cottage makes the holiday all the more special and relaxing. Nice place, nice owners and nice location..
Tell us about your rental experience while staying at The Crofter's Cottage. Let us know if the listing matched your expectations. You can share your comments about the location, property owner/manager and all the unique features that made your stay a memorable one.